SEOUL, Sept. 10 (Yonhap) — South Korea business executives are expected to accompany President Moon Jae-in on a trip to Pyongyang next week to explore potential deals going forward, corporate sources said Monday. South Korean President Moon Jae-in is scheduled to meet North Korean leader Kim Jong-un in Pyongyang from Sept. 18-20. The two have already met twice this year, leading to eased tensions on the Korean Peninsula. 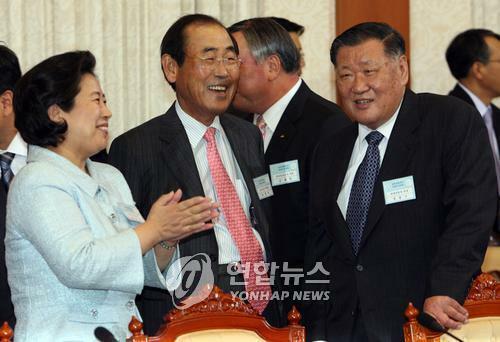 Moon’s chief of staff Im Jong-seok urged business leaders to join Moon’s trip to the North. Im currently heads the summit preparation committee. Leaders of top conglomerates such as Samsung Electronics Co., Hyundai Motor Co., SK Group and LG Group traveled to Pyongyang in June 2000 and October 2007, when Moon’s two predecessors held summits with Kim’s late father, Kim Jong-il.